Your bathroom has unique design challenges found nowhere else in your home. Not only is your bathroom exposed to high humidity and foot traffic, but it’s probably the smallest room in the house. Fortunately, we offer plenty of interior design opportunities for even the smallest bathrooms. Continue reading to learn how to start your bathroom remodel. Floor tiles are waterproof and easy to clean, but don’t let their practical nature fool you. There are plenty of design opportunities that can be unlocked when you choose floor tiles for your bathroom makeover. There are a wide variety of styles, shapes, sizes, and colors you can choose from to create bathroom flooring that’s truly unique. Some ceramic bathroom tile even looks like other materials, like wood or stone. We also offer porcelain bathroom tile. If you’re worried about bathroom floor tiles being cold, we recommend installing them over a radiant heating system. Heated floors add a touch of luxury to an otherwise utilitarian room. While floor tiles can be slippery (especially when wet), this problem can be easily averted by choosing smaller tiles. Smaller bathroom tiles are less slippery because the extra grout creates a textured walking surface. Vinyl flooring comes in sheets, planks, and tiles. The type of flooring you choose for your bathroom will depend on how bothered you are by seams and how much water you expect to spill on the floor. For example, we recommend sheet vinyl flooring for a children’s bathroom, especially if they love to splash in the tub. If you hate the look of seams, we recommend using sheet vinyl flooring. If your bathroom is small enough, you may not even have any seams on your floor. Luxury vinyl flooring is quickly gaining popularity because it can mimic the look of more expensive materials. For example, you may install luxury vinyl plank to mimic the look of hardwood flooring. Unlike hardwood, vinyl doesn’t expand and contract with fluctuating humidity, making it a perfect choice for your bathroom. Are your bathroom countertops cluttered? If so, it may be time to install new bathroom cabinets. It’s not uncommon for bathrooms to not have enough storage space, especially for families. We can help you determine how much space you have for bathroom cabinets. We offer storage options like bathroom wall cabinets or bathroom vanities to help you declutter the counter space around your sinks. 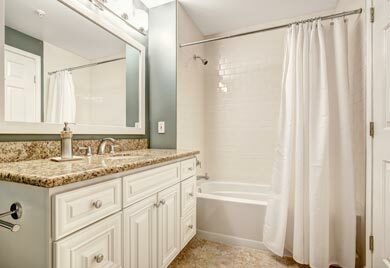 Over time, bathroom countertops can start to look worn or outdated. If this is the case, we encourage you to shop our selection of countertop materials which include granite, quartz, Corian, solid surface, and laminate. We’d be more than happy to help you select the best color and material to complement your bathroom’s interior design. It’s not uncommon for small bathrooms to lack windows. If this is the case, it’s even more important to make sure you have enough bathroom light fixtures. If you’ve used the mirror to put on makeup or fix your hair, you might already know that your bathroom doesn’t have enough light. Even just installing bathroom vanity lights can improve the aesthetic and functionality of a room. 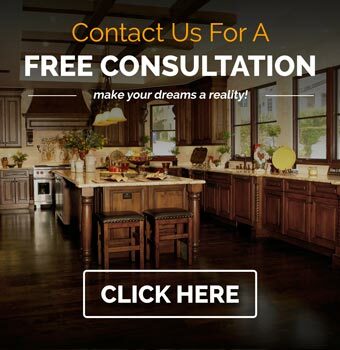 You can count on our years of experience helping clients with home interior design. To browse our selection of bathroom flooring, cabinets, countertops, and lighting call Complete Flooring & Interiors at (616) 458-4806.